Mike Murphy made this perfect pair of two-tone stockwhips. They have steel-enforced cane handles, fully 12plait. The 8plt. thongs are 5.5ft long, of course made of the best roo hide, and have no lead in them. 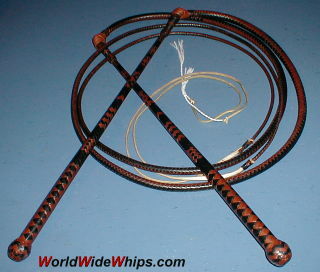 Very elegant whips, fine collectibles as well as a 1st choice for sports whipcracking purposes. Mike, these are wonderful!